We are a small in-home TICA registered cattery near beautiful Savannah, Georgia. 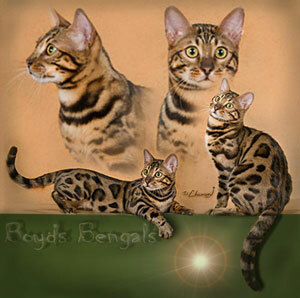 We breed bengal cats with exotic markings, soft pelts and loving personalities. Kittens available year round. Contact us for more information! 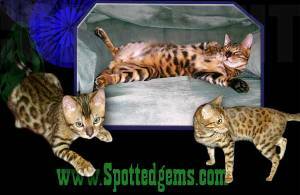 "Sharing our Little Leopard Pride"
Our goal here at Spotted Gems is to raise and nurture beautiful, loving Bengal cats with great personalities. 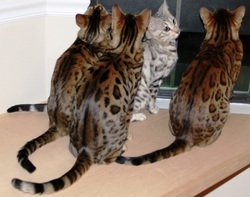 Our family has helped to raise all of our adult Bengals. I am a small in home breeder just 30 miles south of Chattanooga. All of my kittens are TICA registered with champion bloodlines. They are hand raised and socialize with children and other pets. All kittens come with a Vet certificate and health warranty. Shipping is not available but Currier service is available up to 300 miles for a fee.